After the highly successful 1930 World Figure Skating Championships in New York, the U.S. figure skating community directed all of its time, energy and meagre financial resources towards making the figure skating competition at the 1932 Winter Olympics in Lake Placid the very best they could be. At the time, Sherwin Badger was a man of many hats. Not only was he serving on the Olympic Committee, but he was the USFSA President, Manager of the Olympic figure skating team... and a competitor in pairs figure skating with a very real chance of winning America's first Olympic medal in the discipline with partner Beatrix Loughran. With his right hand man Richard L. Hapgood, the Assistant Manager of the 1932 Olympic figure skating team, he set a plan in motion that worked to the benefit of not only himself, but all of the American skaters, coaches and judges who would potentially compete at those Games: holding the U.S. Championships in two parts. The first event, which was actually held on December 27 and 28, 1931, included the senior men's, women's and pairs events and acted as an Olympic trial competition. By holding this part of the annual national event months ahead of schedule, it gave skaters a full month of interrupted training leading up to the Games with zero distractions. The second event, comprised of ice dancing, junior competitions and the first ever competitions for novice men and women, was held after the Olympics. 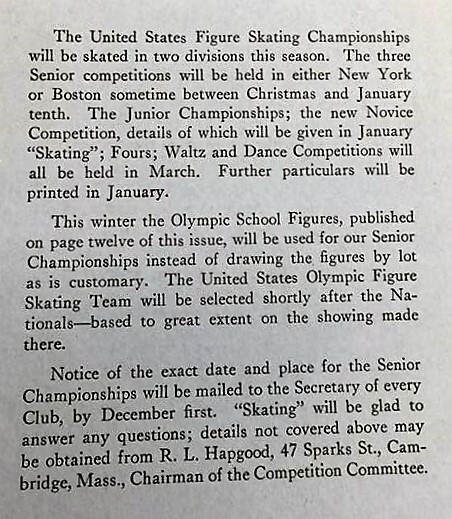 In their official report to the American Olympic Committee in 1932, Badger and Hapgood explained, "The United States Figure Skating Association gave every possible support and cooperation by making numerous alterations in its usual plans for holding national championships. Among other things, it designated the Olympic school figures as the figures for these championships, and this step was of enormous help to prospective members of the team, as they were required thereby to practice and skate only those figures which were expected of them in the Olympic Competitions." The December event, held at Madison Square Garden in conjunction with an elimination Olympic hockey game between the University Club of Boston and St. Nicholas Hockey Club Of New York, was judged by Joseph K. Savage, Carl Engel, Lillian Cramer, Norman Hapgood and Charlie Morgan Rotch. As expected, Loughran and Badger took top honours in the pairs event, defeating Maribel Vinson and Geddy Hill and Gertrude Meredith and Joseph K. Savage. Though all three teams were named to the Olympic team, Vinson and Hill were forced to decline their spot as Hill was unable to remove a scholastic condition at Harvard University to get the time off. Theresa Weld Blanchard was expected to compete in the women's event but ultimately declined, accepting a position as Chaperone of the Olympic team instead. Maribel Vinson took a strong lead in the figures and turned in a flawless free skate - by accounts one of her best - to easily win her fifth consecutive senior women's title. Margaret Bennett finished second, ahead of Louise Weigel, Edith Secord, Suzanne Davis, Audrey Peppe and Dr. Hulda Berger. Bennett of Minneapolis, Weigel of Buffalo and Davis of Boston were the three women to join Vinson on the Olympic team, Edith Secord was excluded because of her Canadian citizenship. In the men's event, Roger Turner of the Skating Club of Boston fell while executing his first figure, a rocker, but judges ruled there was a flaw in ice. He performed exceptionally well in the rest of his figures, taking a lead over Gail Borden II of the Skating Club of New York. Turner faltered twice in free skating, touching the ice while coming out of a half-loop and losing his balance on a spread eagle. Yet in a four-one vote, he defeated James Lester Madden of Boston, Borden, Dr. Walter Langer and William Nagle to win his fourth U.S. title. In the December 29, 1931 issue of the "New York Evening Post", German writer and actor Hugo Louis Sherwin Golitz raved, "It was interesting to observe that, as in dancing, the really finest virtuosos are the men. Not merely in that they are stronger, more agile and speedy than their sisters but - which is more important - they are infinitely more graceful. Addicts of the late Russian ballet may recall that, exquisite as were [Karsavina] and Pavlova, they were always excelled by Nijinsky and Mordkin." After the Olympics, the second 1932 U.S. Championships at the Ice Club were held amidst high spirits, American skaters having won Olympic medals in both the women's and pairs events in Lake Placid. Samuel Ferguson and Valerie Jones of the Skating Club of New York became the first U.S. novice men's and women's champions in history. Robin Lee of the St. Paul Figure Skating Club took top honours in junior men and Louise Weigel of Buffalo added a junior women's title to the senior bronze she'd won in December. In junior pairs, New York liquor salesman Ferrier T. Martin and his wife Virginia emerged victorious at ages thirty seven and thirty one. Nine teams competed in the Waltzing competition. "Skating" magazine reported, "There were so many crack couples, it was well-nigh impossible for the judges to make a selection of the final four." After an elimination round that cut out five teams, Edith Secord and Joseph K. Savage took the win over Nettie Prantel and Roy Hunt, Clara Rotch Frothingham and Frederick Goodridge and Grace Madden and George E.B. Hill. In the Original Dance event, Rotch Frothingham and Hill took the win with a tango variation that Bedell H. Harned referred to as "the best combination of steps this contest had ever produced." Defending Champions Theresa Weld Blanchard and Nathaniel Niles settled for third place behind Secord and Savage. Due to a lack of entries following an exhausting season, a fours competition was not held.